This piece was painted over two days. 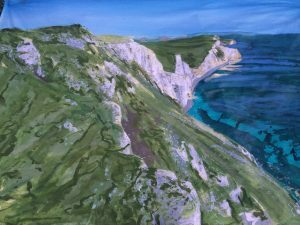 At the end of the first day I wasn’t happy with the piece, throughout the afternoon the bright sun (which was dropping behind me) was ‘bleaching’ or over-exposing the white-chalk cliffs. The result at sunset was a piece which lacked dynamics. 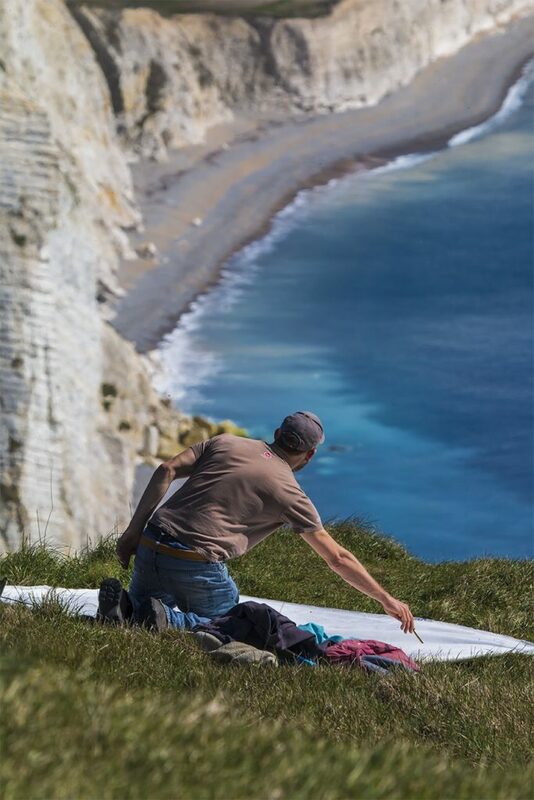 Given that I was painting the view east-wards down the coast I left the canvas pegged to the cliff and returned before dawn. 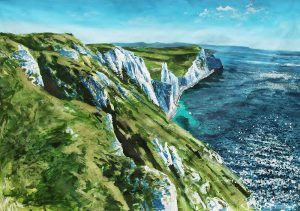 With the sun rising behind the cliffs almost all the tonal values were reversed – the white cliffs were in shadow, the dark sea was flooded with light. I reworked the painting and slowly turned it around into an exciting final piece. If you would like to buy a limited edition giclee print of this piece please click on this link.